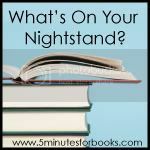 Nightstand time over at 5 Minutes for Books! Checking in with both my Fall Into Reading Challenge AND last month's Nightstand post, I'm actually pretty pleased with my progress. I've made inroads on review copies (which is my huge project to tackle before the end of the year!) and I've also read some books from my own home book shelves which I'm pretty pleased with. Hope you all have a lovely month of reading and I'm looking forward to running around and checking out your Nightstand posts as well! You are making quite a dent in your FIR stack! I have only read 3 books since FIR began. Hooping to finish another three before the end of October. I am starting The Help now and it is 451 pages....so, we will see how long that takes me to get through. It is really good so far, so hopefully I can finish it in a decent amount of time! You know, I've yet to read any John Piper. I agree with you -- that title gets my attention! Great progress on the nightstand! I'm curious about what some of your favorite Christmas books are. We had a tradition growing up that we would get a new Christmas picture book every year (which I have continued with my family ... and picked up some of the ones that we had growing up). I also have a growing collection of adult Christmas books ... any suggestions? 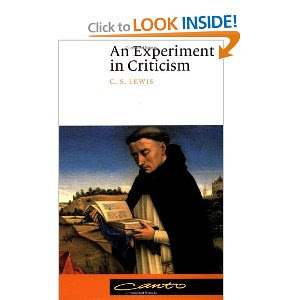 I had not heard of An Experiment in Criticism until seeing Janet mention it, and I want to red it some time. 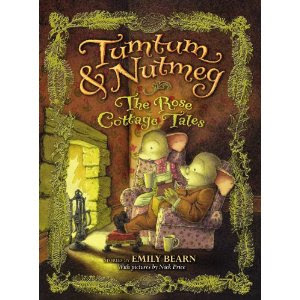 I'm thinking that T&N are the new MBS recommendation from you-- the kids and I need to read these soon! I love how you purposely skip review copies so you can buy your own...and yes, John Piper...it will be good! Ha ha you are very funny with the Tum Tum stuff. But I do hope to get to it soon myself. When Molly Was a Harvey Girl is a Cybils nominee, so I'll be reading it within the next two months probably. 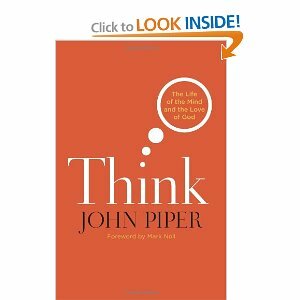 I hear so much about John Piper but have yet to read anything by him - shame on me; I hope that book is great! I love Jules Verne's writing. I've only read Around the World in 80Days and The Journey to the Center of the Earth but I am a fan! Tumtum intrigues me! I look forward to hearing your thoughts about it! I’ll look forward to your review of Great Lives. Oh, you have Think! I’d like to know what you think about it (no pun intended). I definitely want to read it soon. Enjoy! I haven't read any John Piper yet, though I really should. Maybe I'll make that a priority for next month, depending on what I can find at the library. Good luck with your list! I hope you're able to get all of the review copies out of the way so that you can read whatever your heart desires! I am looking for a recreational read for the holiday season...any recommendations? re: recreational holiday reads. I'm preparing a post on that subject soon so stay tuned! I DO have some books to recommend that I think are just plain fun.